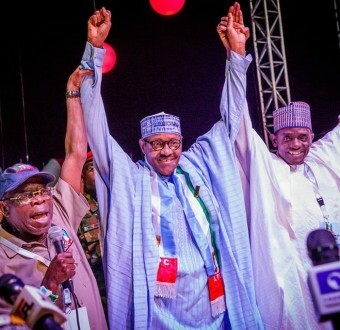 Here's the full text of President Buhari's acceptance speech as the party's presidential candidate in the 2019 elections - SWANKYLOADED OFFICIAL BLOG. 2.? I would like to pay tribute to Chief Bola Ahmed Tinubu, Chief Bisi Akande the first chairman of our great Party and to Chief John Oyegun who led the party until this year and all the APC Governors. 3.? The result of the presidential primaries of the All Progressives Congress this time is different because I am the only candidate. I thank all other eligible candidates who deferred to me in the interest of our party unity and over-all national stability. 5.? As I stand today before you, there is no honour greater than the confidence given to me by all of you when you affirmed my nomination. I thank you for your support. I thank you for your guidance. I thank you for staying committed to the CHANGE agenda. 6.? I accept this honour as a tribute and mark of confidence to carry the responsibility as we all join hands to continue the good work of the APC government to 2023 and beyond. 8.? We can be proud of our achievements. CHANGE has come. Ladies and Gentlemen, fellow Nigerians, think how much PDP Governments earned between 1999 to 2015. Think what they did with it. 9.?What did they do with your money? 10.? Internationally, Nigeria is now respected. My inter-action with foreign heads of state and government has been very encouraging. The international community is very supportive of our efforts to put our country in order. 11.? Ladies and gentlemen, Members of APC. I thank you deeply for your support and confidence in me. I will not let you or the people of Nigeria down.